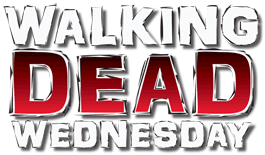 You know what Walking Dead Wednesday could use? Some plain humans! It's entirely possible that you remember this, but when the Walking Dead Mystery Minis line started, it was not allowed to use any characters who had appeared in the comics, which really limited their pool. That changed in Series 2, but Series 3 really went wild with it - in a 17-figure series (20 figures, if you count the three unannounced Hot Topic exclusives), only five of them were zombies. This is a very human-heavy assortment! But if it hadn't been, do you think we would have gotten Maggie this soon? Heck, in just one series, we get her, her husband, and her father! (They probably skipped her sister because she was kind of unbearable until Season 5). 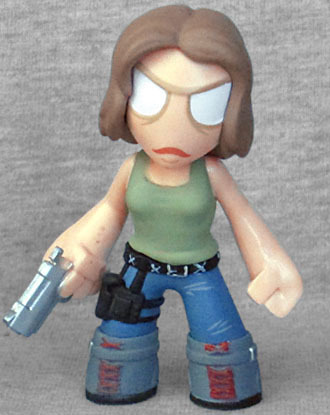 Maggie is wearing the outfit from when they were clearing the prison (and thus, when she made her Overly Attached Girlfriend face) - blue jeans, a green tank top, and grey boots with red laces. Her belt has white X's painted sculpted on, and her jeans have sculpted seams and pockets, plus a few painted lines to make them look like they're wearing out. She's holding a silver pistol, and has a holster sculpted on her thigh. Her head is cocked slightly to the side, and the small lines painted beneath her (sculpted) eyes make her look tired. 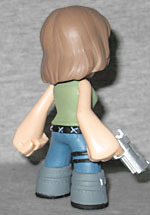 Maggie is available in a 1:12 ratio, making her one of the most common Series 3 figures. She has no variants, because what would have been cool enough to bother with?